Hoopsnake Press returned in 2014 to the recently renovated original studios at 1249 Coley Road in Tupelo, Mississippi, and Ke Francis, Kerry Francis, and former students M.J. Torrecampo, Jager Palad, Lujan Perez, Corin Robidoux, Anthony Mancuso, Shanna Stiles and Nicole Dikon are painting buildings, creating work and preparing the 2016 exhibition schedule. Mary Francis continues to serve as editor. Now thru Feb. 17, 2017. Work of Ke Francis & Hoopsnake associate artists exhibited. Reception & artist presentation 2 PM Feb. 17. Nov. 11, 2016 - Show & reading by Ke Francis. Recent Bookart Acquisitions: University of Arkansas Ft. Smith. Atlanta Biennial - thru 12/18/16 - 3 Hoopsnake Press publications were exhibited. Wesleyan College, Macon, GA - thru Dec., 2016. 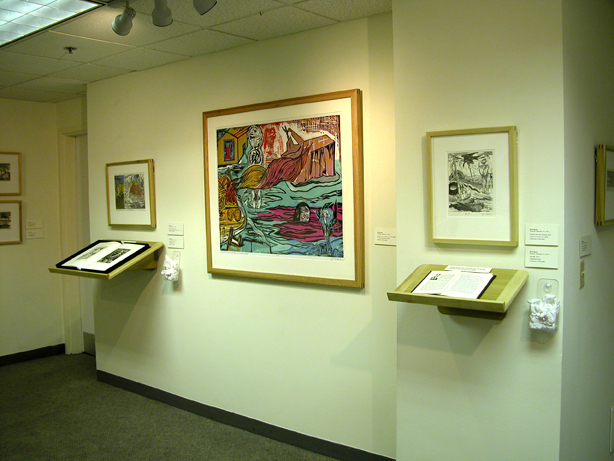 Work of Ke Francis & associate artists exhibited. State of Flux - Gumtree Museum, Tupelo, MS, Sept. 20-Oct.25, 2016: Work of three Hoopsnake associates exhibited. Where Identities Meet, Gumtree Museum, Tupelo, MS, Aug. 3-Sept. 15, 2016: Work of four Hoopsnake associates exhibited. Swoope Gallery Orlando, FL, Sept. 8, 2016: Show, talk & reading by Ke. Mississippi Book Festival, August 20, 2016, Jackson, MS: Ke participated in a lively panel discussion & Hoopsnake books & prints were sold in the Caron Gallery tent. Recent Book Art Acquisitions (3 works by Ke Francis included) Vanderbilt University Library exhibition. ORLANDO MUSEUM OF ART, Installation view.